"Strike Three!" deals with the cancellation of the 1994 World Series and the replacement players who followed. Both of these events were historic and Nikco Riesgo was one of the first players to cross the proverbial picket line and put his career on the line for the good of the game. 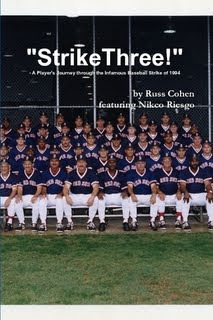 In his own words, " This book re-lives my real life experience during the Major League Baseball strike of 1994 and why I decided to play against the enormous pressures of the Major League Players Union - to unify all professional players within one union, from the minor leagues to the majors. Any player who dares to play this "Game" must read this book and share it someday with their grandkids. You will never forget this." Available now at LuLu and next week at Barnes & Noble, Borders, and Amazon. I was heartbroken at the strike of 1994 and walked away from the game entirely until the concluding months of the steriod tainted HR chase of 1998. This book provides an interesting take on that ugly season.